Peaceville Records have proudly announced the signing of cult Norwegian band Mysticum, which will result in the release of the long-rumoured second studio album, Planet Satan, a record almost 15 years in the making. Unifying the core trio of Herr General Cerastes, Svartravn and Mean Malmberg, Mysticum will commence work on the new album shortly. One of the pioneering industrial black metal forces to emerge in the early 90’s, Mysticum brought to the world a completely unique brand of psychedelic discordant black metal with insane drum machine patterns and synths. They were originally signed to Euronymous‘ Deathlike Silence Productions label, such was his belief in the band. However, this venture proved to be cut short following his murder, forcing Mysticum to look elsewhere for the release of their eventual debut album, In the Streams of Inferno. Mysticum‘s past releases, consisting of 1996’s In the Streams of Inferno and the collection of the band’s other works, Lost Masters of the Universe, will both be re-released by Peaceville with new artwork and with a remastered sound, along with bonus material. Release dates for these titles, plus Planet Satan will be announced in time. The band stated: Mysticum is back! A few months ago we decided to gather forces again, and finally start the making of the cursed album Planet Satan. After considering several offers and going through negotiations, we decided to sign with Peaceville Records in order to have a proper record label to back us up. Peaceville will handle our complete discography and also make our old material available. So along with “Planet Satan” you can expect re-releases of “In the Streams of Inferno” and “Lost Masters of the Universe“. Stay tuned for more folks! ‘The Rains Begin’, the debut video from Barren Earth‘s new masterwork, ‘The Devil’s Resolve‘, is now finally complete. The video was directed by Ville Rissanen at Obscure Entertainment, who has also previously worked with fellow countrymen, Insomnium. Mixed by Dan Swanö (Opeth/Katatonia) at Unisound, ‘The Devil’s Resolve’ continues with all the trademarks one has come to associate with Barren Earth: brutal riffs, gloomy growls, majestic melodies, as well as acoustic and progressive passages. But this time the band has delved even deeper, and takes their music to the extremes. What was brutal on the first release is now tripled and what was proggy is also tripled. Audio & video clips, including a new video interview with bassist Olli Pekka-Laine can be found here. ‘The Devil’s Resolve’ is to be released March 12th on Peaceville Records on CD & vinyl. Barren Earth! Their awe-inspiring godlike debut, “Curse Of The Red River” has already taken the album of the year title from me in 2010, and once again, I’ve expected an album that will blast away all the other releases this year. And how right I was! It would be too early to announce it as the album of the year, as I’m expecting some more delicious material, but I guess, in the end I’ll crown “The Devil’s Resolve” the best album of 2012. But why is it so great? Their secret is their unique mix of genres. I’d say the most important element of their formulae is 70’s psychedelic prog rock with all it’s beautiful cleverness, twisted melodies straigtening out to beautiful stillness, and of course, the excessive trademark use of Hammond, Mellotron and Moog synths. So take this, put it into your musical mortar and mix it with grunty death metal, deep doom metal, and throw in some folky catchiness played on beautifully crawling lead synth sounds and some great pianowork evoked by keyboard wizard Kasper Mårtenson. Of course there is some resemblance with some old-school Amorphis material, but it’s natural as bassist/founder Olli-Pekka Laine and also keyboardist Kasper Mårtenson were defining members of the legendary finnish band by that time. As I’ve already mentioned two members, let’s take a look at why people are calling Barren Earth a ‘supergroup’. Besides the aforementioned great ex-Amorphis members, there are four other legendary musicians. Genius drummer/backing vocalist Marko Tarvonen (Moonsorrow/October Falls) was present on almost all albums of the year for me in the past 5 years. Doom fans surely love the amazing voice of Mikko Kotamäki (Swallow the Sun), and I’m glad he utilised more of his great clean vocals. The totally unique and oldschool guitar work is provided by Sami Yli-Sirniö(Waltari, Kreator) and Janne Perttilä (Rytmihäiriö, Moonsorrow – session). The lead guitar work of Sami is totally amazing, he is one of the rightful kings of oldschool shredding. I don’t think anyone could doubt the musicianship of this great line-up, it’s simply perfect. The Devil’s Resolve delivers us 8 perfectly composed tracks, without fillers, or a track that would stand out in a positive or negative way. The album starts on the top and maintains perfection until the end of the last second of the last song. I cannot even pick a favourite, I simply love all the tracks, but if I really have to pick a favourite, I’d pick fourth track “As it is written”, which features some really tasty guest bagpipe performance by Korpiklaani’s Hittavainen. The record starts much like “Curse Of The Red River”, with a short tension-building introduction implemented in the first song. Soon all the awesomeness gets unleashed, and it won’t let you quit listening the album until you’ve listened to it at least 3 times in a row, and still if you manage to escape, you’ll still sing around the melodies all day. Is it better than “Curse Of The Red River”? No it’s not. Is it worse? No it’s not. It is different, yet it’s familiar. 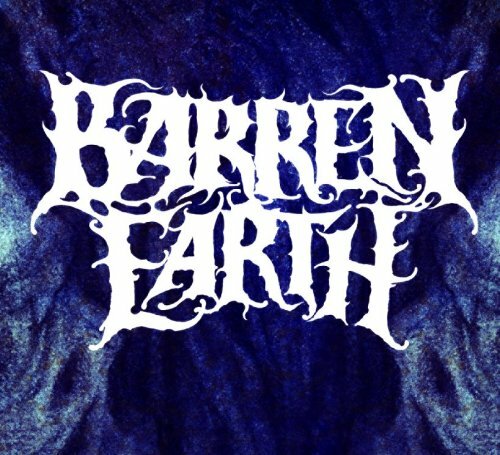 Barren Earth has managed to reserve all their trademark sounds yet create a new atmosphere. Mikko uses much more of his clean vocals this time, yet “The Devil’s Resolve” is more aggressive than the debut. Interesting dualities everywhere. Please dear readers, do yourself a favour, and purchase this masterpiece, you won’t regret it. Put the cd in your hi-fi, lie back on your favourite sofa, pour a glass of your favourite wine and wonder if life could be any better. 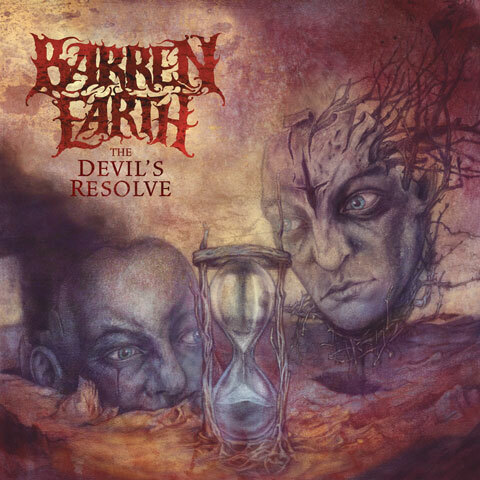 Barren Earth: “THE DEVIL’S RESOLVE” set to be unleashed! The Devil’s Resolve is the studio album from the fast-rising Finnish maestros of progressive death and doom metal, Barren Earth. The sophomore album from the Finnish metal titans is set from release March 12th via Peaceville Records. The new album comes two years after the release of their debut The Curse of the Red River, which made a massive impact upon its release with fans and critics alike. The Devil’s Resolve is said to take the listener across musical landscapes utilising the trademark sounds of Barren Earth including brutal riffs, gloomy growls, with some extra pieces such as… No, not that… Bagpipes (Courtesy of Jaakko Lemmetty from Korpiklaani)! And if that’s not good enough for you… There will also be an appearance of Mathias Lillmåns from Finntroll who shall be providing guest vocals. Artwork comes courtesy of renowned artist Paul Romano (Mastodon).